This page is a translated version of the page The King and the translation is 100% complete. The "Società Anonima Pennini King", owner of the The King trademark was founded in Turin in 1926, and even in his later incarnation as "Società Anonima Fabbrica Italiana Stilografiche" (SAFIS), is considered to be one of the leading Italian fountain pens manufacturers. Although there are links connecting it with the OMAS, at least in the early years, the company is today considered as an independent producer. The pens branded The King are of the highest quality, which is why for a long time have been attributed to the most reputed manufacturers (usually OMAS, with which the company had links). They have nothing to envy to the production of the better national and international brands and are of great interest to collectors. A 1932 The King invoice. The The King was founded in Turin as The King Società Anonima Torino in 1926, while the trademark The King Superior (Reg. Gen. N. 38982) was recorded in 1928. Although for long time the hypothesis of a trade mark used only for production on commission has been credited, the discovery of the re-registration of the same trademark in the 1946 on behalf of SAFIS leads to the conclusion that it is a single company, apparently forced to change its name because of the the fascist regime policies of forced Italianisation of names. 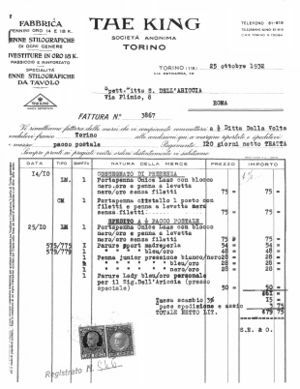 Further confirmation of the existence of The King as an independent company is also evident from the recently found invoice reported by side, that also allows you to determine with certainty that at least until 1932 the company remained active as "The King Società Anonima Torino".For a long time one of the assumptions made about the origins of the brand The King had been to regard it as a production commissioned by the OMAS because of the similarity of some production, and the fact that the brand is mentioned as part of the products made ​​by the commission OMAS in the text "Stilografiche Omas dal 1925 ad oggi" published by the "Club Internazionale della Stilogragrafica A. Simoni". The initial production marked The King consisted of excellent quality hard rubber safeties marked The King Superior, they were pens made ​​in the Waterman 42 style but with beautiful engraved clips. From the same period is also the production of overlay pens engraved with the mark on the edge of the cap, like the one shown in the image on the left. This initial production features original characters and cannot be attributed to the OMAS production. It's also known a production of lever filler models. 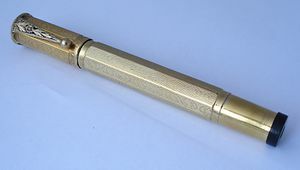 An OMAS penna del dottore marked The King. A link with OMAS is certainly evidenced by the "penna del dottore" marked The King shown in the side picture. It's possible, therefore, that some models, like the one shown, were produced to order and then rebranded. So it we have clear traces (as we shall see below) that link The King to OMAS is still totally unreliable the opposite hypothesis that would have been the The King/SAFIS to produce OMAS pens, since the company's foundation is later. The later production were flat top models that as much of the Italian production of the time turn out to be clear imitations of the Parker Duofold. These models are still branded as The King Superior and produced in two sizes and five colors. Unlike Duofold there pens were equipped with an original twist filling system which can be accessed by unscrewing the cap anyway. During this period the top model is the The King Diamond, featuring a cap with countersunk head decorated with a greek band. This patent is a second point that bears witness of the presence, at least in early years, of a strong link with OMAS. The image of the filling mechanism used by these patented pens, present on the The King catalog found in the Omas archives and on this advertisement, is in fact identical to the one on an Armando Simoni patent (nº US-1784078), that in the French version appears to have been achieved in Italy in 1929. A further indication that somehow it was the OMAS to provide technology to the The King in the early years of this company.Around the 1934, the The King Società Anonima Torino changed name in "Società Anonima Fabbrica Italiana Stilografiche" and the production adopted the brand Radius, even though there are presumably contemporary examples use of the mark the King. Initially not precisely known, the date of the name change to SAFIS is now well known; the Radius brand was recorded in 1934 with the new name, and the exact date July, 6 1934, results from the test of the comunication of the name change to the "Consiglio Provinciale dell'Industria". After WWII the restrictions imposed by the fascist regime ended and the brand The King was taken up by the SAFIS, and re-entered the market with the production of quality fountain pens, substantially equivalent to the simultaneous production of Radius brand, but did not reach the level of excellence achieved over the initials years. ↑ according to Enrico De Muro research, reported on the book "I marchi registrati delle Stilografiche Italiane" based on document archived in the Turin commerce chamber, the company was founded June, 23 1926, with Giovanni Rossi as president and Enrico Lattes as statutory auditor. ↑ Letizia Jacopini reports in her book the n° 268827, but that's too similar to Columbus nº IT-268327 and on a sample (see this photo) there is imprinted the nº IT-4572-1929. ↑ Letizia Jacopini in his book "La storia della stilografica in Italia", illustrates how Bruno Milocani and Emilio Pionzo witness the shift of production from the King to Radius in 1935 or so. ↑ a copy of the communication of the shareholders meeting resolution is found in the Enrico De Muro book: "I marchi registrati delle Stilografiche Italiane".